Specifically, the Work portal cannot be used given that it does not load up completely. The browser console does not illustrate on a specific cause, however the JEE application server log may include details about UnsupportedClassVersionError. 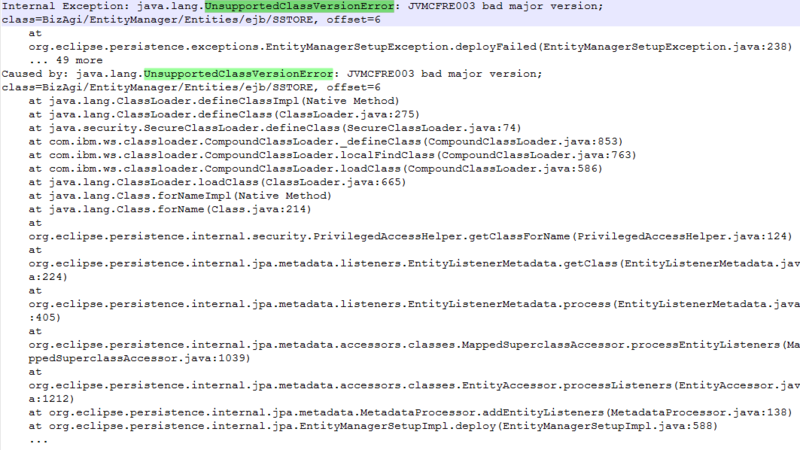 Whenever an unsupported version error shows up, double-check the Java version used to generate your .ear application. A bad major version stack message may indicate that you are using a higher Java version than that one supported (e.g., using JDK 7 or 8 for a 10.x release). Ensure you repeat steps to generate the .ear application by using the JEEConsoleManager. This time, explicitly set the use of any Java version as supported by Bizagi version.